Pelorus Jack Sailing, Snorkelling and Fishing trips in Paradise was formed 8 years ago with the purchase of the “Pelorus Jack” aka PJ sailing boat. Two years later the company realised that their guests also wanted to fish, Island hop and were in need of transfers to the outer Islands, and hence purchased the vessel “Watchdog” a New Zealand built Ramco design, a great boat for either fishing, Island hopping and transfers. Another vessel named Milika II, a 28 ft Islander, was purchased later which is also ideal for fishing, island hopping and transfers. Pelorus Jack is a 50ft ferro yacht that was built in Montreal Canada and has sailed around the world. PJ then spent many years in Auckland NZ, before sailing to Brisbane Australia, where she was purchased and sailed to Fiji, that was 8 years ago, and PJ has been sailing the Yasawa and Mamanuca Group of Islands ever since. 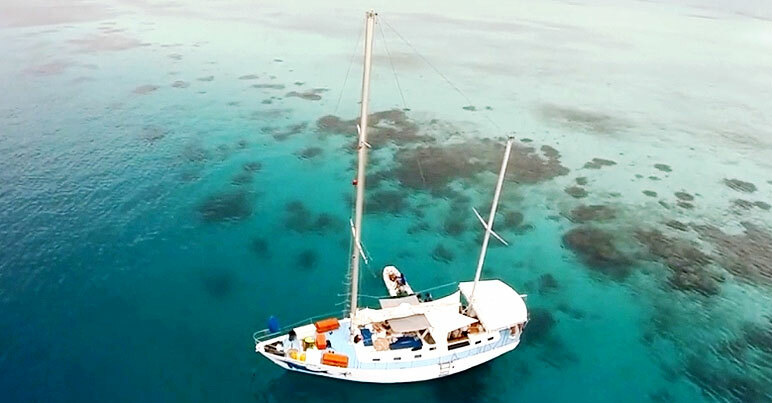 The Company has grown since 2010 and is now known as PJ's Sailing, Snorkelling and Fishing trips in Fiji. We all at PJ's, take pride in show casing Fiji's natural beauty by offering our guests an Ultimate, unforgettable experience in Paradise, whether it be Sailing, Snorkelling, Fishing or Island Hopping! Enjoy Everything Fiji Has To Offer. Book Your Trip Of A Lifetime Now! If for any reason, PJs Sailing and Fishing Adventures needs to postpone your cruise, you will be offered an alternate date to transfer your cruise to. If another date is unavailable you will be offered a full refund. 24-hour cancellation policy applies: There will be no refunds for cancellations by you the client within 24 hours of departure. No refunds for No Shows. Pelorus Jack (fl. 1888 – April 1912) was a Risso's dolphin that was famous for meeting and escorting ships through a stretch of water in Cook Strait, New Zealand, between 1888 and 1912. Pelorus Jack was usually spotted in Admiralty Bay between Cape Francis and Collinet Point, near French Pass, a notoriously dangerous channel used by ships travelling between Wellington and Nelson. Pelorus Jack guided the ships by swimming alongside a water craft for 20 minutes at a time. If the crew could not see Jack at first, they often waited for him to appear. Pelorus Jack was first seen around 1888 when it appeared in front of the schooner Brindle when the ship approached French Pass, a channel located between D'Urville Island and the South Island. When the members of the crew saw the dolphin bobbing up and down in front of the ship, they wanted to kill him, but the captain’s wife talked them out of it. To their amazement, the dolphin then proceeded to guide the ship through the narrow channel. And for years thereafter, he safely guided almost every ship that came by. With rocks and strong currents, the area is dangerous to ships, but no shipwrecks occurred when Jack was present. Many sailors and travellers saw Pelorus Jack, and he was mentioned in local newspapers and depicted in postcards.